Dewitt offers a wide variety of different landscape fabrics to suit nearly any application. These high quality fabrics are available in various roll sizes and thicknesses. DeWitt provides a wide landscape fabric product offering for virtually every landscape or growing related applications. This weed barrier is made from woven polypropylene fabric and is a very durable and versatile fabric that is capable of performing many functions. It is a great choice for both cost-efficiency and durability. Woven polypropylene, needle punch fabric with its reinforced fiber is perfect for weed control and offers excellent soil retention. 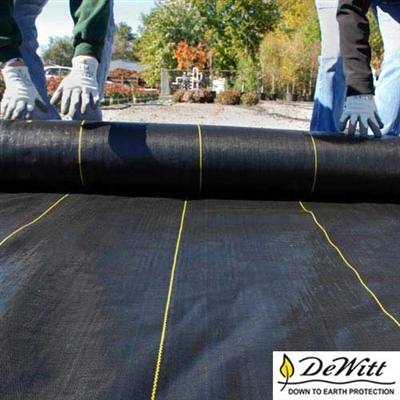 The DeWitt Pro 5 weed barrier is a very tough and long lasting landscaping and weed control fabric. This polypropylene fabric is constructed to resist rotting and degradation. It's needle punched allows water, air and nutrients to seep slowly through the material while stopping weed growth. DeWitt Pro 5 is an excellent product for controlling weeds, blocks insects and works great when applied under mulch, rocks and soil. It's an excellent choice as a retaining wall backing and preserves the moisture in soil. It is a very popular product for use in greenhouses for preventing weeds and soil stabilization. This weed barrier offers excellent quality as well as being cost efficient. It's widely used by private and public utilities and landscape specialists. While offering great durability and flexibility, it's the ideal product among landscapers. It's very easy to unroll, cut and install, secures with the ground very easily by using staples, stakes or spikes. The underliner is installed directly under the waterproof pond liners. It will protect the liner from any sharp objects, abrasive materials and offers additional support. 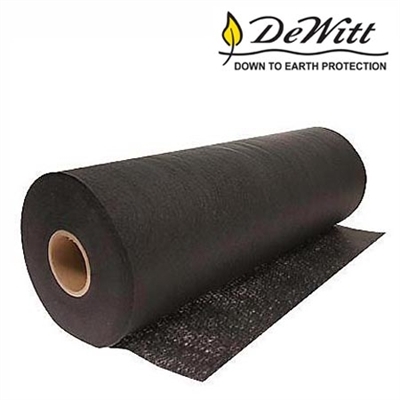 DeWitt Bulk Protection Underliner is designed to protect liners in pools, ponds and waterways. 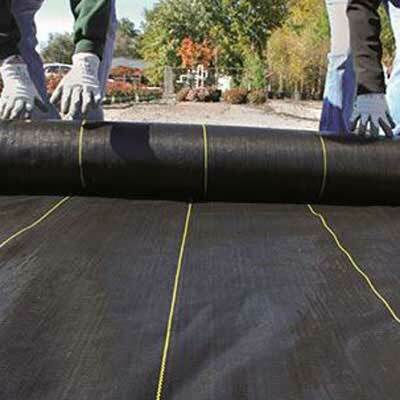 It's tough, puncture resistant, durable and safe for installation under pond liners. The last thing you need to run into are tears and punctures in your pond liner. This product will protect the liner from rocks or other sharp objects while providing support over soft areas that can produce gaps. It's a permanent, one-time installation that will last for years to come. It's very easy to work with as it's pre-cut into various sizes. This pond underliner is developed to protect the waterproof pond liners that are usually installed in man-made ponds, pools and waterways. 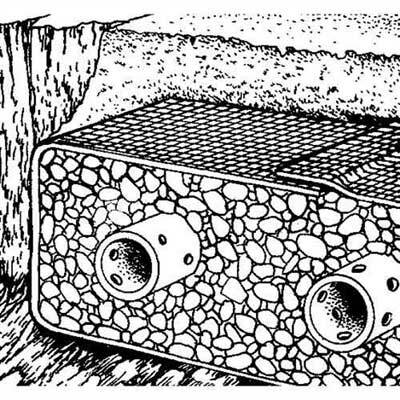 It provides stability and a smooth surface for supporting the pond liner that is often governed by stress points because of the large volume of water above it. Many times people use inadequate materials such as cardboard, carpet padding and newspapers to support the liners. Unfortunately, they easily fall apart or rot which will lead to big problems down the road. The DeWitt underliner is a permanent solution to designed to permanently protect the rubber liner from puncture. The DeWitt Company has been the leading pioneer in the field of penetrable weed control fabrics. Sunbelt is a 3.2 oz polypropylene ground cover that offers the best absorbency to let in water, nutrients and air while blocking out weeds. This ground cover will last between 8 to 12 years. Sunbelt ground cover comes with UV resistant elements that will hold up under direct sunlight for longevity. This polypropylene material is tough enough to stand up to punctures, tears and the penetration of weeds. It conveniently offers gold stripes, every 12-inches, for easy alignment and spacing of plants. It is ideal for general weed protection, for any outdoor display and greenhouses. For over 30 years, DeWitt has been leading the way in weed control fabrics and product development. They were the first company to offer these fabrics and now produce some of the highest quality as well as a widest selection of quality woven ground covers on the market. Sunbelt ground cover is a woven black polypropylene fabric that is excellent for penetrating water, nutrients and air through its fabric while blocking out light that is required for weed growth. This is the perfect fabric for general purpose weed control and water conservation. It's excellent for general planting where weed prevention is a must, ideal for greenhouses and outdoor displays. This high quality fabric blocks 99.7% of light, withstands tearing, puncturing and weed invasion. It has been approved by government weed control applications and normally lasts between 8 to 12 years. This woven black polypropylene ground cover is an excellent choice for cost-effective weed control and landscaping. With UV protection, this is a very long lasting material for areas that are open and in direct sunlight. Ultraweb 3000 is the ideal landscaping and weed control at a very cost-effective price. This superb material costs a great deal less than many inferior products, while guaranteeing a far superior and long-lasting performance. DeWitt Ultraweb 3000 woven ground cover is the perfect choice for your needs. 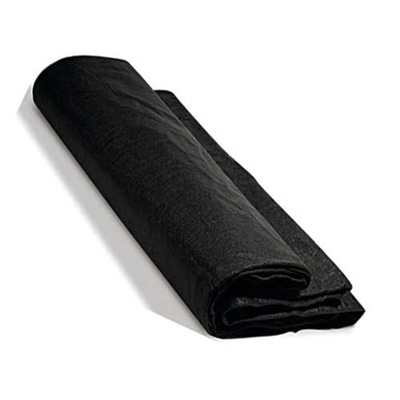 This fabric is conveniently designed to fold into 6-foot long rolls for easy shipping and handling. It's 12-inch colored lines make spacing and plant alignment a breeze. It is perfect for open spaces with direct sunlight thanks to its UV protection. It is manufactured with state-of-the-art weaving technology for superior performance and longevity. For those looking for cost-efficiency, this landscape fabric is less expensive than your standard 6 mil mulching plastics, while delivering a much longer lifespan. It's ideal for safe weed control and water conservation. This is a choice product for greenhouses, landscaping needs and horticultural requirements. This non-woven polypropylene fabric will not rot or decay and offers the perfect solution for erosion control and is great for weed control. 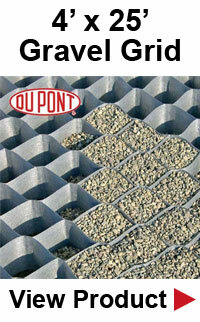 This is the perfect choice for drainage and soil filtration and offers superb erosion control, permanently. This is a very popular product for asphalt overlay with its 120 lb grab tensile strength. Geotextile is used by gardeners for separating certain soils and garden spaces easily. It is designed to offer excellent cushioning and is perfect for weed control. 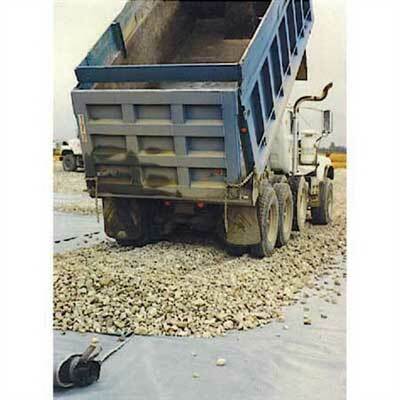 Non-woven geotextile has been developed to take care of multiple landscaping projects while offering one of the toughest materials on the market. It's used on many construction sites and is found under many foundations. This fabric will keep soil in place while letting water pass through it. It offers a permanent erosion control when placed behind retaining walls and banks. This material is also used for asphalt overlay because it provides an excellent, stable base. It can also be used for weed control underneath sidewalks pathways, bricks and even concrete. 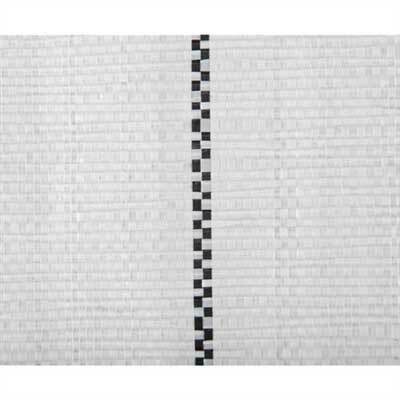 This is a woven white polypropylene fabric that is very thick, is UV protective and can double as a frost blanket. It can be placed under mulch or rock or on the top of the soil. It will provide you with 3.2 oz, sq yd, thickness for added protection during extended seasons. This white woven polypropylene fabric works perfectly as a general purpose weed barrier, is puncture and tear resistant and is UV stabilized for a long life. This white woven polypropylene ground cover is perfect for general purpose weed barriers that allows for the absorbency of water, air and nutrients through the material, while blocking the light required for the growth of weeds. It's also the perfect choice for safe weed control and water conservation. This fabric is UV treated for longevity in open spaces and full sunlight while doubling as a frost blanket for extended seasons. This fabric can be used on top of soil or under mulch and soil beneath the surface. This is an excellent choice for outdoor crop rows, raised beds, greenhouses and nurseries and is an all purpose landscape fabric. This white colored fabric is ideal of reflecting light up onto plants and is very useful for growing roses and other similar flowers and plants. The DeWitt Company has been pioneering the field of permeable weed control fabrics with over 30 years of product development. DeWitt Company has absolutely all fabrics for all purposes for any of your gardening, landscaping, driveways, pathways, sidewalks, and the list goes on, needs. You can trust their product line because they truly are the leading pioneers in ground covers, weed protection, wall retention and flower beds. If cost-effectiveness is on the top of your list, they offer the very best pricing while guaranteeing the very best quality. Home gardeners and professional landscapers alike, choose DeWitt products for all the landscaping needs.